I am not huge on gift giving material items during the holidays. I know that sounds a little bah humbug. I just do not like the pressure of trying to buy presents for someone that probably doesn’t need or want that gift. So I normally stick to what I know everyone in my life enjoys. There is truly nothing better than an edible gift in my opinion (except maybe kittens) My friends and family usually get little tins or baskets of all my favorite foods either purchased from my favorite stores/bakeries, or made by me. Last year, several of my friends received tins of peppermint bark. 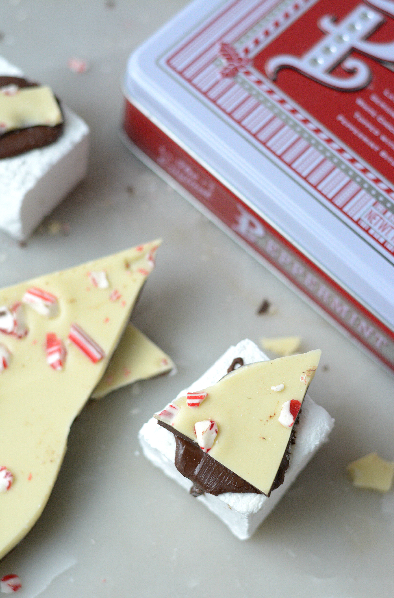 So when I was approached by my friends at TheFeedFeed and Williams Sonoma and asked to create a fun holiday treat, using Williams Sonoma’s Peppermint Bark…. I said HECK YES! Or better yet #BarkYEAH! I already loved the stuff anyways, and knew exactly what I wanted to do with it. Use it in some of my edible gifts! 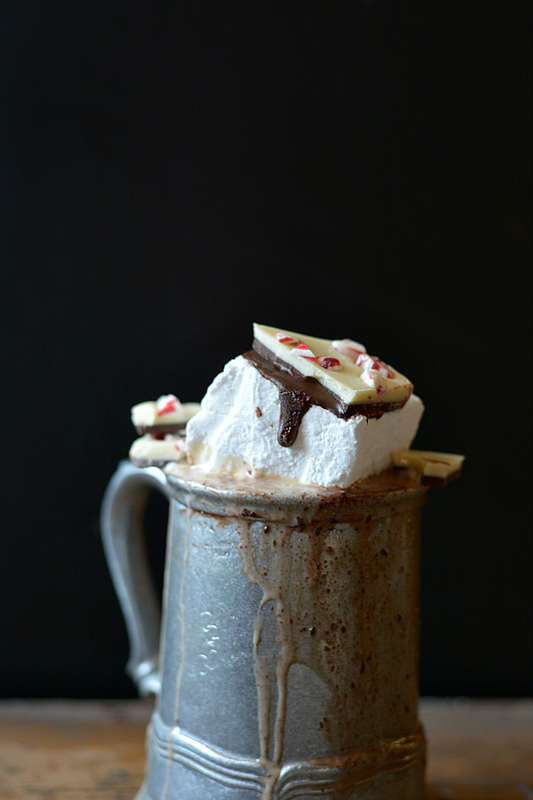 This year I am gifting hot chocolate mix in cute mason jars, and pairing that with a stack of my homemade peppermint marshmallows. To dress my delicious, but slightly boring looking marshmallows up, I topped them with a dark chocolate coating, and a big piece of that delicious peppermint bark from Williams Sonoma. Line a 9x13 baking dish with foil, and spray it generously with non stick baking spray. Set aside. In the bowl of an electric mixer fitted with the whisk attachment, add half of the water, peppermint extract and all of the powdered gelatin together and allow to sit for at least 5 minutes. Add remaining water into a 2 qt sauce pan along with the corn syrup and granulated sugar. Bring to a low boil over medium heat, watching it closely, allow it to boil until all the sugar has dissolved. Remove from heat. Turn the electric mixer on medium/low speed, and slowly add in the sugar and corn syrup mixture. Once it is all added, slowly turn mixer to high. Mix on high for about 8 minutes, or until the marshmallow is shiny and stiff. Using a rubber spatula, quickly pour the marshmallow into the prepared baking dish. To smooth it out, you can spray a rubber spatula and carefully press and smooth it out. Allow it to cool at room temperature for at least 4 hours, if not overnight. On a clean surface (like your counter) coat it lightly with powdered sugar, and transfer the set marshmallows on to it. Using a sharp knife or kitchen sheers cut the marshmallows. Toss cut marshmallows with powdered sugar, and set aside on a piece of wax paper. In a microwave safe bowl, add dark chocolate chips and coconut oil and microwave for about 45 seconds or until the chocolate is melted and smooth. 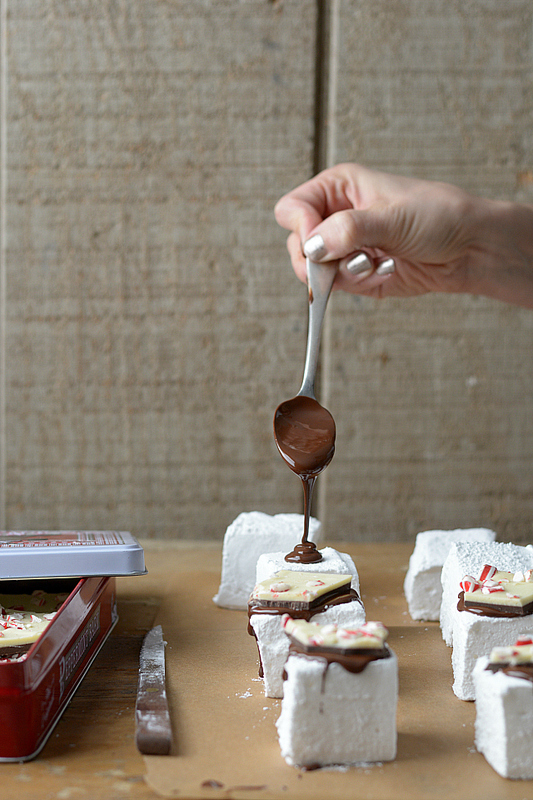 Drizzle the tops of each marshmallow with chocolate, place a broken piece of peppermint bark on top of each marshmallow. Allow to sit for about an hour for the chocolate to set. Serve with hot chocolate, or enjoy as is!